We started with a great museum experience in Bath today. 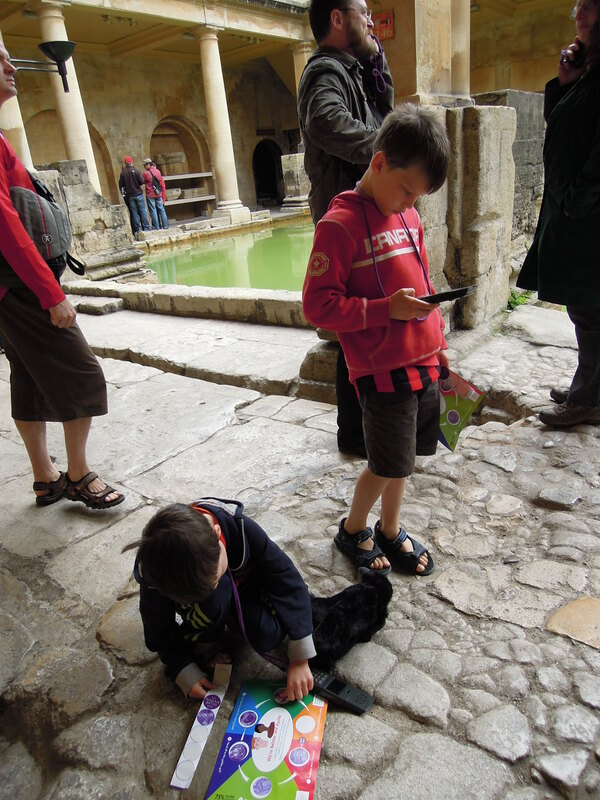 We went to see the famous Roman baths, of course! They had an audio tour gadget for each of us, and this kept the kids completely focused and engaged the whole time. It is funny to see them independently tour a museum in such a serious way. They led the tour, their little faces furrowed in concentration, scanning the artifacts. Then the rain started. We’ve lived with sporadically stormy weather every day. Today was the first honest rain that we have experienced on the trip. The kids held out for a couple of hours as Stephen and I struggled to find things to do in the rain. Boredom won out in the end. They went squirrelly close to dinner. Now we are sitting in a pub, waiting for our dinner. I’m quietly writing this post on my phone. The kids (and Stephen) are on the iPad playing games. First time we have resorted to this all trip. Not bad. Tomorrow we are off to Stonehenge and then our flight to Munich.